Jennifer Chiaverini continues her quest to be known as more than the author of the Elm Creek Quilt novels, which was truly a wonderful series. I truly enjoyed her first book about historic women in history, Mrs. Lincoln’s Dressmaker. The Spymistress missed the mark with me a bit as it read in places more like a history textbook instead of fiction. 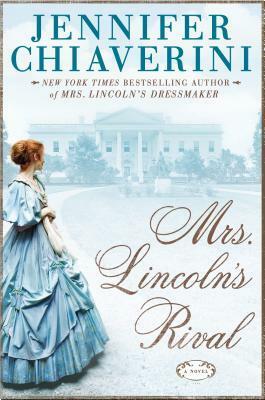 In Mrs. Lincoln’s Rival she pulls back on the history book feel and gives the story a more fictional feel. But it just didn’t hit the heights of Mrs. Lincoln’s Dressmaker. These women of history are ones that are not as well known and it was very interesting getting to know Kate Chase Sprague but while there was a bit of tension between her and Mrs. Lincoln I wouldn’t call it a rivalry. Kate Chase was her father’s right hand during his pursuit to become President and while he was Secretary of the Treasury. She was very savvy and smart and knew how to garner favor and make the right connections. Her own endeavor to become First Lady whether it be with her father as President or as the wife of the “Boy Governor” from Rhode Island was so strong she made some interesting decisions. I also found her to be very spoiled and demanding that rings just a little wrong for the time period, but I know the author researches these women intensively. She tries very hard to stick to the facts and not overly embellish but at times it comes across as just a bit dry and this reader wanting more. I get the feeling the marriage between Kate and William was quite volatile and more details on that could have really turned this story on its ear. The Civil War was a terrible time in history but in ways it correlates to the division in our country today, thankfully without the bloodshed on American soil. I found some of the actions taken by Congress and President Lincoln depicted in this book very telling in the ways history repeats itself. Sometimes it is easier to see when the situations are fictionalized but based on facts. If Chiaverini continues this road of writing about historic women I know she will hit the right balance between the fact and the fiction because she is an excellent writer. I am anxious to see who she will choose for her next subject. All three of these books were educational. I encourage the author not to be afraid of being a little more creative in her storytelling. They are fiction and readers are comfortable with the facts being muddied a bit to give the story a more natural flow. Jennifer may be coming to a bookstore near you. Check out her event schedule here. This sounds like a lovely read! Thank you for sharing. I just finished Mrs. Lincoln’s Dressmaker. A good overview of what was going on in the White House at the time. A very thoughtful review. You’ve really pointed out the challenge of historical fiction writing – finding that balance between the history and the story. I hope that you are right and that Ms. Chiaverini finds the perfect blend in future.